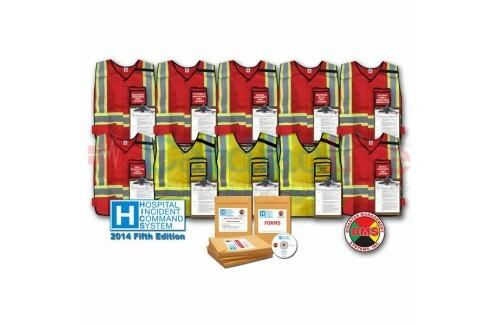 Disaster Management Systems' HICS Kits are the only kits that are shipped ready to deploy as soon as you receive them. 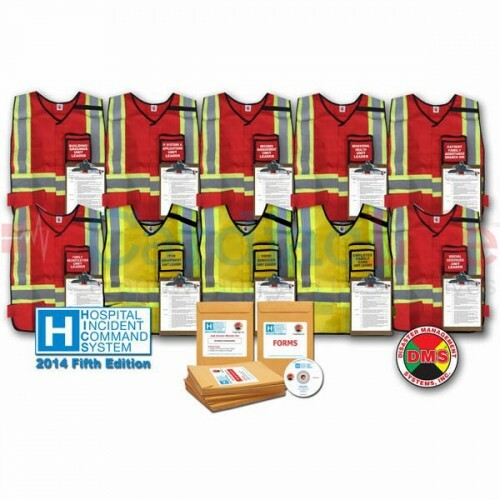 Every position vest is shipped with position responsibility sheets on clipboards with pens. "Building/Grounds Damage Unit Leader" is now "Building/Grounds Unit Leader"
Replacement Vest for this position is included in this compliance upgrade kit. "Information Technology Unit Leader" is now "IT Systems & Applications Unit Leader"
"Mental Health Unit LEader" is now "Behavioral Health Unit Leader"
"Patient Family Assistance Branch Director"
NEW - "Social Services Unit Leader"
NEW - "Family Reunification Unit Leader"
"IT/IS Unit Leader" is now "IT/IS Equipment Unit Leader"
"Family Care Leader" is now "Employee Family Care Unit Leader"